La Lepre Bianca Farmhouse is a family-owned agricultural holding which is specialized in the production of organic fruit , mostly pears and apples. La Lepre Bianca is located in Emilia Romagna, thoroughfare for cultures, jobs and flavors,. Here the art of socialize, the connection with the oldest flavors but also the curiosity for solid and promising new things as well as passion and strong commitment to the work have always been the main identification features. 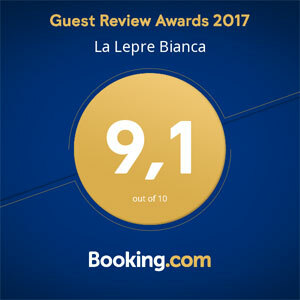 It has been already 4 generations that La Lepre Bianca Farmhouse presents really detailed interiors, that, perfectly in line with the natural environment, will let you experience an overall immersion in the countryside life inside of the courtyard, filled with suggestion and peace. La Lepre Bianca farmhouse is an excellent bio-agricultural holding that organically grows and produces fruits and vegetables: the key products are pears and apples, accompanied by a smaller production of apricots and blackberries (that we use for organic marmelades) as well as smaller amount of vegetables.Barbara, referente dell’agriturismo, vive nell’edificio principale della struttura con la propria famiglia, ed è presente e disponibile ad assistere gli ospiti. The contact person of the farmhouse, Barbara, lives in the main building with her family, always ready to welcome the guests and attend them to.La Lepre Bianca farmhouse in Cento (Ferrara) is both for who is looking for a farmhouse to taste the traditional Emilian food, and for those who want a relaxing and pleasant location for a romantic as well as business stay .